The use of Docker as an application container management system has become standard practice for developers and systems engineers in the space of just two years. Some like to say that haven’t seen such a technological advance since OpenSSH. Docker is now a major player and is widely used in cloud systems architectures. But more than just that: Docker knows how to win developers over. Let’s take a look at an overview of what we’ve done with Docker, as well as an assessment of the future and of the competition that is appearing on the horizon. Docker is a microcontainer management tool that uses libcontainer. Developed in Go by Solomon Hykes, Docker became open source in 2013 and was quickly adopted by key accounts. The tool’s flexibility was a game changer. Before its arrival, creating an application container required a mastery of relatively advanced concepts. LXC had already started to grab the lion’s share, giving “pure virtualization” solutions a run for their money. OpenVZ and Xen also played some role. But those systems were mostly designed for server solutions, and demanded considerable configuration work. Like OpenVZ, Xen and LXC, Docker uses the principle of rootfs, which is nothing more than a root file system. It uses a tree structure as the root for a remote system (like chroot would do) and offers a network layer and a set-up system. But it also has its share of differences. First, its images and containers are layered using union mount filesystem (as aufs, devicemapper, …). On the one hand, this saves disk space, but it also makes it possible to quickly build a container without copying an entire root. Lastly, Docker comes standard with the ability to manage an image versioning registry. By default, a public registry is used. That registry offers a multitude of off-the-shelf images (either official images or images submitted by users in the community), as well as a private space that can be made available for a fee. In theory, Docker is quite similar to Git and its Hub could be compared to a service like GitHub. It also uses common concepts like commits, tags and a remote registry server. Docker’s primary appeal is undoubtedly its ease of creating containers to manage microservices. 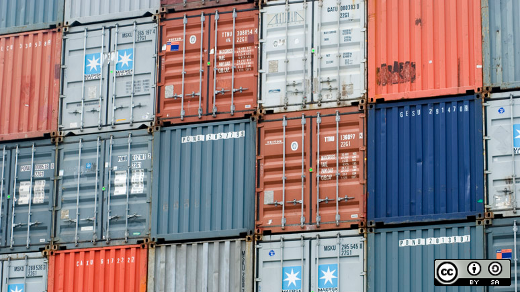 A container is, first and foremost, a way to completely isolate an application. Thanks to its libcontainer library, Docker uses that memory and process isolation through the management of cgroups. Docker won’t open a port on the host machine unless specifically asked to do so. If two containers need to communicate via the IP layer, they can be linked together so that those two instances can communicate using names instead of IP addresses (that may change each time containers restart). Docker has become very popular in the cloud for the low level of resources that it uses, its volume management and its union mount filesystem, which reduces the disk space needed. In studying how Docker works, you realize that it is very simple to create a scalable and/or high availability system. Here is an example of architecture used in one of our projects. The master server can then take appropriate action, such as by modifying the nginx server’s configuration, or deleting/removing an upstream server. Another option is to change Docker’s configuration so that the API is accessible in TCP mode (making it network accessible). In this specific case, a small client connects to all the slave servers and listens to all their events. Otherwise, the principle is the same as above: each event will allow an upstream server to be added or deleted in nginx (for example). The “web” service is linked to “db” (see the “links” directive in the example above), so it is possible to read environment variables that supply MySQL addresses and ports (presented in its Dockerfile). Resolved container names can also be used, and “web” and “db” are considered to be machine names in the two containers. You will also have noticed that the port bind has also been handled. Because developers don’t necessarily have the rights to use port 80, we map the local port 8080 to the Apache container’s port 80. The developer just needs to visit 127.0.0.1:8080 to see the Drupal instance in action. To understand this connection, take a look at the diagram below. It might almost seem like Docker is alone in its world, bathing in its sea of praise. But remember that Docker uses libcontainer and cgroups, meaning that, to be able to use those kernel capacities, the service has to run as a root. And this could potentially be exploited. This is actually CoreOS and other’s criticism of Docker, despite its evident attraction to this technology, which allowed CoreOS to create one of the best-known cloud systems today. Docker requires root rights in order to interface with cgroups. But a service that runs as a root could potentially create a hole in the system.